As you might already know, this Saturday, April 29th marks two very exciting bookish happenings. 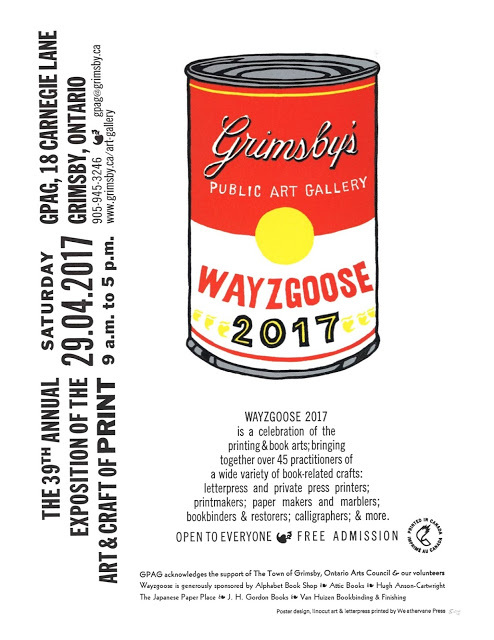 First, it’s the date one of our favourite book events of the year—the Grimsby Wayzgoose! We take part in the wayzgoose at the Grimsby Public Art Gallery every year. The wayzgoose is basically a wonderland for everyone who loves the art and craft of the book. Printers, bookbinders, papermakers, wood engravers and many other artists and other bookish folk set up tables to sell their beautiful wares and chat with friends old and new. We’ll be there with hot-off-the-press new releases like Daddy Hall and The Museum of Possibilities, as well as a fresh, new printing of A Gathering of Flowers from Shakespeare. Also on offer will be a wide selection of poetry, non-fiction, wood engravings, and issues of the Devil’s Artisan. This year, we’re especially pleased that the Grimsby Public Art Gallery also happens to be showing an exhibition featuring the original artists’ book that inspired Leon Rooke and Tony Calzetta’s Fabulous Fictions & Peculiar Practices. Be sure to explore the exhibit, then stop by our table and pick up your copy. If you’re too far to take in the delights of the Grimsby Wayzgoose, have no fear. You, too, can get your literary fix! It is also Authors for Indies Day. This is a very fun day for authors, booksellers and book lovers alike. Not only do authors volunteer to be guest booksellers, they also sign books, hold readings, chat about storytelling and much more. Express your appreciation for your local independent bookstores by taking part—you’re sure to have a blast. I’m so looking forward to meeting you all at the wayzgoose. Please come and introduce yourselves—I love putting faces to names! Otherwise, I hope you have a wonderful Authors for Indies Day supporting your local, hardworking independent booksellers. This entry was posted in Letters from the Porcupette (the Intern's Blog) and tagged Authors for Indies, Daddy Hall, Fabulous Fictions, Grimsby Public Art Gallery, The Museum of Possibilities, wayzgoose. Bookmark the permalink.